PwC launched its 'Entertainment and media outlook: 2015 - 2019 (South Africa - Nigeria - Kenya)' report, which presents annual historical data for 2010-2014 and provides annual forecasts for 2015-2019 in 11 entertainment and media segments for South Africa, Nigeria and Kenya. "This year's outlook shows consumer demand for entertainment and media experiences will continue to grow, while migrating towards video and mobile. Increasingly, though, it is clear that consumers see no significant divide between digital and traditional media - what they want is more flexibility, freedom and convenience in when, where and how they interact with their preferred content." After more than a decade of digital disruption, the African entertainment and media industry has entered a new landscape - one where the media is no longer divided into distinct traditional and digital spheres. South Africa's Internet access market will rise rapidly from R32.5bn in 2014 to R76.2bn in 2019, far ahead of any other consumer spend category, making it the largest contributor to South Africa's total entertainment and media revenues. "Consumers are choosing offerings that combine an outstanding and personalised user experience with an intuitive interface and easy access. This includes shared physical experiences like cinema and live concerts, which appear re-energised by digital and social media." The entertainment and media segments for South Africa, Nigeria and Kenya are the Internet, television, filmed entertainment, video games, business-to-business publishing, recorded music, newspaper publishing, magazine publishing, book publishing, out-of-home advertising and radio. Aside from the Internet, the Outlook predicts that the fastest growth will be seen in video games, business-to-business and filmed entertainment. "But it is Internet access itself that is acting as a driver of revenues in video games and film, creating new revenue streams by making over-the-top (OTT)/streaming or social/casual gaming viable to more consumers and thereby cancelling out physical falls," adds Myburgh. Music, magazines and newspapers, which will show only moderate consumer growth, are three segments that face strong competition from the Internet. The music market was worth R2.01bn in 2014, compared to R2.08bn in 2013. Annual revenue is forecast to grow marginally by a CAGR of 1.3% over the next five years to remain relatively flat at R2.1bn in 2019. Television remains a highly significant contributor to consumer spending, with combined revenues from TV subscriptions, advertising and licence fees projected to reach R40.9bn by 2019. The report also shows that one consistent trend - and not just in South Africa, but globally - is the rise in overall consumer spending through to 2019 on video-based content and services, against far flatter prospects for spending on primarily text-based content and services. If consumer revenue from TV subscriptions and licence fees is aggregated with that from video games, around R4.5bn will be added between 2014 and 2019. In contrast, consumer revenue from books, magazines and newspapers is expected to rise by just R1.3bn over the entire forecast period. Alongside video providers, a further thriving source of revenue over the coming five years will be live events. Revenue from live music is expected to grow at a CAGR of 7.9% in the next five years, reaching R1.5bn in 2019, up from R1bn in 2014. Box office revenues are also steadily increasing at a CAGR of 3% to reach R972m by the end of the forecast period. The appeal of live entertainment has also had a positive effect on the related advertising revenues. South African cinema advertising revenue is also rising at a CAGR of 6.7% and will be worth an estimated R884m in 2019. "It is clear that consumers value - and are willing to pay a premium for - real-life physical entertainment experiences, and these in turn are the types of consumers that advertisers wish to target," adds Myburgh. TV advertising is by far the largest contributor to total advertising revenues, followed by newspaper advertising: however, their combined 52% share of total advertising in 2014 will fall slightly to 51% in 2019. Despite the strong projections for advertising, its share of the entertainment and media mix is predicted to decrease by 2019 as consumer spending takes an ever-larger part of the pie; from 35% in 2014, advertising will account for just 30% of spending in 2019. "Affordable Internet access will continue to digitally disrupt the market in novel and innovative ways. The ongoing spread of services to mobile networks, novel devices and emerging markets will change how media and entertainment are served, consumed and monetised in multiple ways. Affordable Internet access will also inhibit the revenue growth of various sectors as consumers use it to access free, ad-funded and lower-priced subscription-based versions of new and existing media services," says Myburgh. Nigeria's entertainment and media market grew by 19.3% in 2014 to reach US $4bn. By 2019, the market will be more than twice as big, with an estimated total revenue of US $8.1bn. 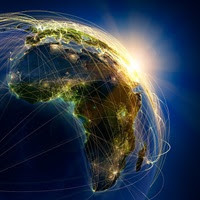 As in South Africa, the Internet will be the key driver of growth for Nigeria. Television, comprising revenue from TV advertising and subscriptions, is the other main driver. Kenya's total entertainment and media industry was valued at US $1.8bn in 2014, up 13.3% from 2013, when it stood at US $1.6bn. The market is expected to surpass the US $3bn mark in 2019 to reach US $3.3bn. Again, the Internet is expected to be the largest driver of growth, followed by television and radio. TV advertising will overtake radio in 2016, and Internet advertising will see the fastest growth rate at a CAGR of 16.8%. Traditional mediums such as TV, radio and newspapers will continue to be the first choice for most Kenyan advertisers in the near future. Concludes Myburgh, "Today's media companies need to do three things to succeed: innovate around the product and user experience; develop seamless consumer relationships across distribution channels; and put mobile (and increasingly video) at the centre of the consumer's experience."